Every idea starts with a problem. Why are we still using the same technology to deliver vaccinations as we did back in 1853? One hundred sixty years after the invention of the needle and syringe, we're still using them to deliver vaccines; it's time to evolve. Here's what evolution looks like. ​The Flu Patch delivers vaccinations through a tiny patch that’s smaller than a postage stamp and has the potential to increase flu vaccine coverage across the globe. Improved immunogenicity by targeting the skin's dendritic cells. Initial studies have shown the Flu Vaccine Patch to be more efficacious than traditional needle immunizations. The Flu Vaccine Patch is designed to allow it to penetrate through the protective outer layer of the skin to deliver the vaccine. 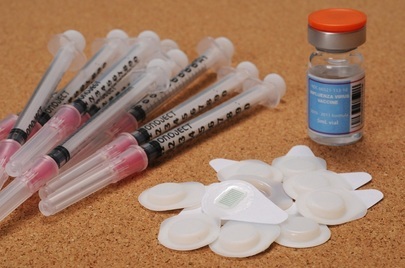 With the traditional needle and syringe, needlestick injuries are common and can lead to serious consequences due to the transmission of infectious diseases. The World Health Organization estimates 1.3 million deaths per year occur due to cross contamination and needle stick injuries. It is also estimated that around 10% of the population are considered to have needle phobia. The Flu Vaccine Patch allows for simple administration with minimal training. No needle or sharps waste. It is also packaged in a single dose presentation which allows for minimal drug wastage. Reduced or no cold chain. The vaccine patch may be shipped and stored at room temperature. The coating formulations used to coat the patches can provide for adequate temperature stability of the vaccine. As a result, vaccine distribution would not need to rely on a costly cold distribution chain that is otherwise required to prevent temperature damage which can render conventional vaccines ineffective or potentially harmful. Temperature stability also introduces the option of distributing vaccines to parts of the world where cold chain infrastructure is unreliable or virtually non-existent. Designed to deliver vaccine directly to the key immune cells just below the skin surface. These microneedle patches do not reach a depth where they meet nerve endings, thus making the vaccination experience much less painful. Cost savings due to using less vaccine to achieve an effective immunization, elimination of cold chain costs, significant reduction in the costs associated with needlestick injuries and a small package size which allows for simplified, less costly storage, distribution and disposal. ​It is time for an overhaul of the current vaccine administration process as well. Currently, it is quite a process to produce a vaccine and get it into the arms of the public. The annual ritual of visiting a doctor's office or health clinic to receive a flu shot may soon be outdated. It may soon be possible to order the vaccine from FluPatch.org, receive it in the email and self administer the vaccine. This could make getting a "flu shot" much easier for the whole family. As we at FluPatch.org improve the flu vaccination process we plan to implement the "buy a patch, give a patch" program in partnership with the World Health Organization to get more vaccines to those most in need and help prevent suffering worldwide from influenza disease.